Tomorrow, Mighty Jaxx will release the newest figure in Huck Gee’s epic Gold Life Mini Figure Series – Peng Peng: The Clockwork Assassin! This automation bodyguard was gifted with an accidental sense of self awareness and curiosity by her creator, the crazy clockwork scientist Master Finley Earl Fintelheimer. When her consciousness wakes from a deep slumber, Peng Peng steps out of her Master’s shadows and carves out her own path, away from the isolated hills and out into the brave new world. What a wonderful new addition to Huck’s beloved Gold Life Mini Figure Series! 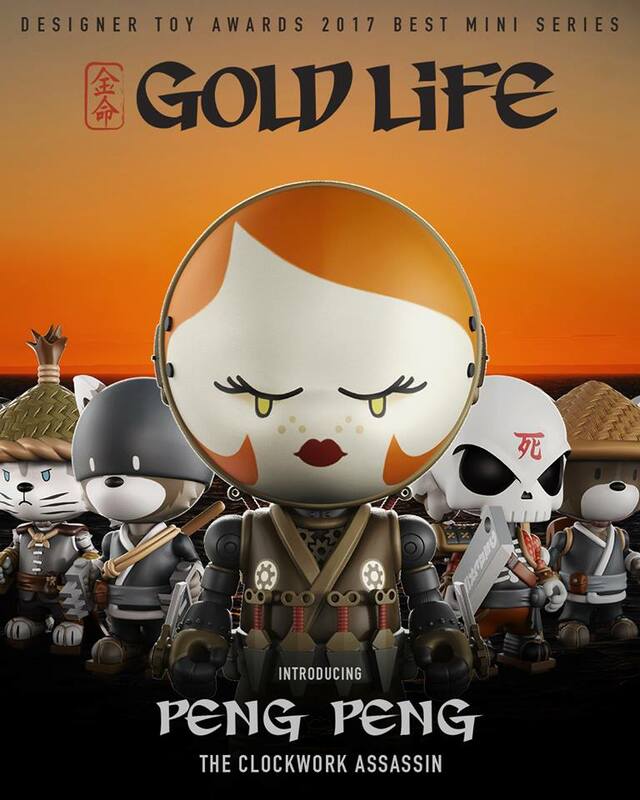 Peng Peng: The Clockwork Assassin Gold Life Vinyl Figure by Huck Gee is a 4” tall limited edition PVC art collectible. Each figure comes in a blister packed printed box. Collectors can purchase this exciting new figure tomorrow, Saturday, June 17th, at the Mighty Jaxx online store for $30.